The Dark Room: spectral space of photography and film in Alexander Nicolas Gehring’s Messages from the Darkroom and Michael Powell’s Peeping Tom is an essay I wrote for the Brighton Photo Fringe Open ’11 exhibition (November 18 – December 18) as a contributing Guest Curator. It is profoundly seductive to believe that photography can be an evidentiary medium of a realm beyond our mortal coil. Even more provocative is the idea of photography, and subsequently film, as a tool to facilitate our voyeuristic desire to see the invisible (fleeting moments, ghostly visions, and even intense fear). In his series Messages from the Darkroom, Alexander Nicolas Gehring taps into photography’s psychological strangeness by positioning its construct and production as spectral sites. 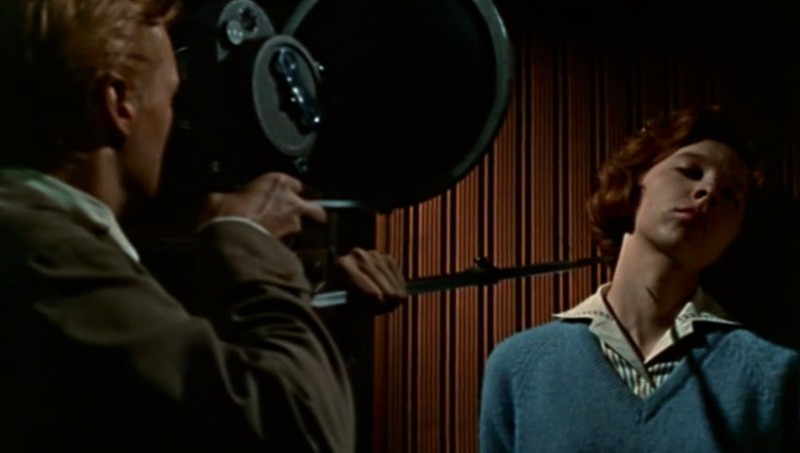 This depiction of the camera as an object to channel, capture, and visualize deathly moments, as well as its function in fulfilling our desires to bear witness, was explicitly explored in Michael Powell’s controversial, and equally luscious film, Peeping Tom (1960). What interests me is Gehring and Powell’s shared urge to confront the past via photographic means and how their work comments on what Martin Scorsese declared [in a 2010 interview with Mark Kermode celebrating the 50th anniversary of Peeping Tom] as our “morbid urge to gaze”. 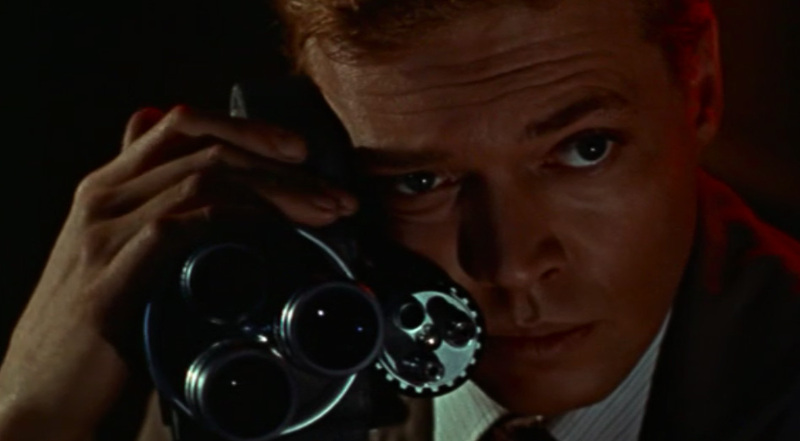 This cultural gaze has evolved in the decades since the release of Peeping Tom, with its nearly prophetic social commentary, into something that is at once more familiar and disturbing in our contemporary world. With this “morbid urge to gaze” in mind, Messages from the Darkroom and Peeping Tom fundamentally comment on the attempt to visualize and record the ultimate gaze: that of death. The very foundation of the photographic medium aims to preserve aspects of memory, life, and experience in relation (and perhaps in reaction) to this very personal and profound moment we will all experience. Channeled through the lens of the camera, and re-born in the haunted space of the darkroom, the spirits contained and preserved within these images have been called forth by the artist/photographer/filmmaker/mad scientist. 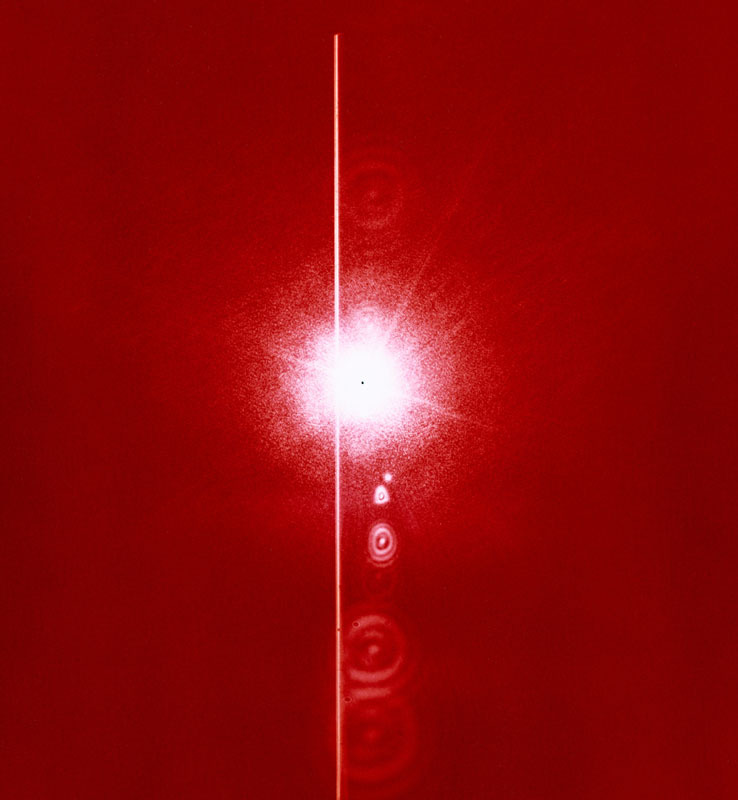 Based on the historical usage of photography by scientists and occult practitioners to capture the presence of ghosts in “spirit photography”, Alexander Nicolas Gehring’s Messages from the Darkroom brings to light how space, specifically the room where film is processed, functions as a site for the spectral. This series conflates the notion of “medium” in photography in that the camera produces a physical medium (a photographic image) and acts as a spiritual medium (a channel between the living and non-living). Here the camera is medium in literal form, producing a representation of what some believe to be objective documentation of ghosts, becoming a bridge between the corporeal and spiritual worlds. Still, what is most interesting about Gehring’s photographs is not the evoked image itself but the concept of a spectral site, a place where the dead are re-born and re-placed back into the land of the living. Now revered as a British new wave classic, Michael Powell’s career-ending Peeping Tom treads similar waters in its fetishization of camera objects, the haunted space of the darkroom, voyeuristic eye, and the distinct presence of the dead. The film shows how the torturous childhood of Mark Lewis continuously haunts his adult state of mind, compelling him to use his camera as a recording device and lethal weapon. In glorious Eastman colour, the aesthetic of Peeping Tom – the visualization of the darkroom as two-toned, red and black, dark and shadowy, warm and clinical – is most noticeable in Gehring’s photographs Medium and Light Phenomenon. The camera in these works is captured as a self-contained medium and as a sculptural object. As Powell suggests by alternating viewpoints between Mark’s “special” camera with the another “outside” lens, Gehring’s confrontational camera is also shown through the unrepresented lens (an autonomous camera that functions as the audience point-of-view). The darkroom (connoting the laboratory, dungeon, cellar, etc.) is a space of process and discovery. Gehring’s darkroom becomes the place of the séance. Referencing the photographic documentation of paranormal activity by notable early twentieth century German psychic researcher, Albert Freiherr von Schrenck-Notzing, Messages from the Darkroom focuses on the dead returning and co-mingling with the living via photographic representation. 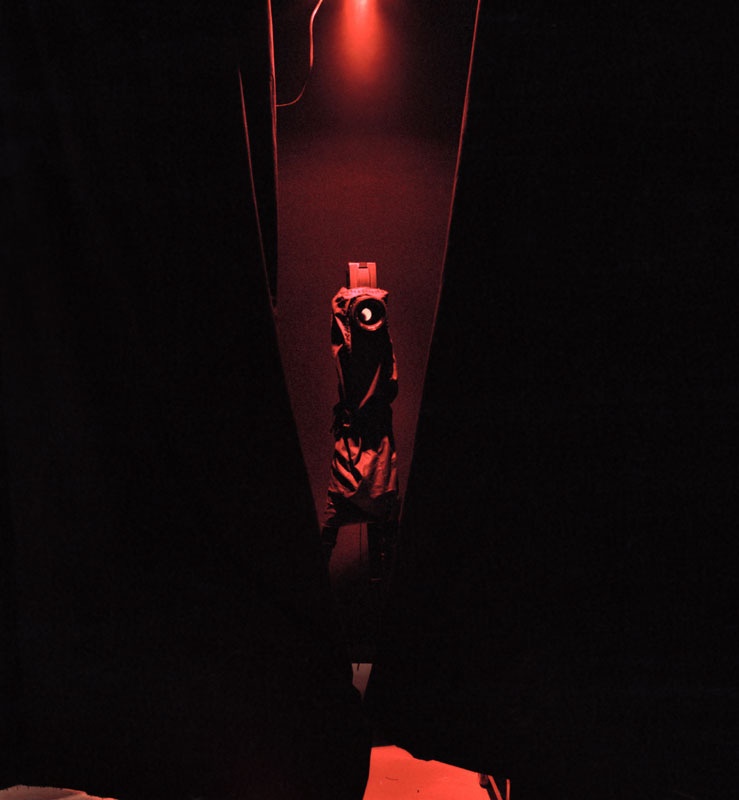 This darkroom references an arena of scientific research where new technology is used to capture the unseen, in this case ghosts, in an attempt to be in closer contact with an extension of human existence. The darkroom and cinematic space in Peeping Tom acts as a dual place of sanctuary and fear. In this room, Mark returns to the site of his own psychological abuse by processing and consuming the films he makes by murdering women. With each repetitive viewing, these victims are repeatedly brought back to life, made to watch their own death, and be killed again. Of course, this is the very nature of the filmic/photographic medium itself, a sensitized form capturing a specified series of events in time that can be replayed in perpetuity. As time and space collapse, that which is depicted onscreen never truly fades; always existing as it was at that very moment it was captured, frozen forever on celluloid. Furthermore, our current moment is one where the medium of film is in the process of becoming obsolete. In the wake of the quality, ease, and accessibility of digital technology, there appears to be little use for analog outside the realm of nostalgia. A near living object itself (film curator Henri Langlois firmly believed that nitrate film had to be used/exercised in order to stay alive), film now finds itself in a ghostly space within the digital realm. Alexander Nicolas Gehring and Michael Powell are seduced by the psychic camera as evidence but wary of its ability to produce accurate visual records. Gehring engages in an obsession to document the afterlife while Powell challenges the perversity of documenting all aspects of our lives. They contest the “all knowing” camera eye because they also consider what happens outside of the frame; photographic representation inherently lays on the liminal boundary between fact and fiction. The foundation of the darkroom is what grounds these layers of suggested ghostly presence within the photographic “medium”. Itself in danger of becoming a thing of the past, this dark room provides the spectral space in which we can conjure up the unseen and indulge, repeatedly, in our collective and cultural morbid desire to gaze. Skype has opened its online-structured client beta on the entire world, after establishing it largely in the Usa and U.K.
and video nevertheless, those demand a connect-in installation).